Art Shows | The Messy Palette . . . 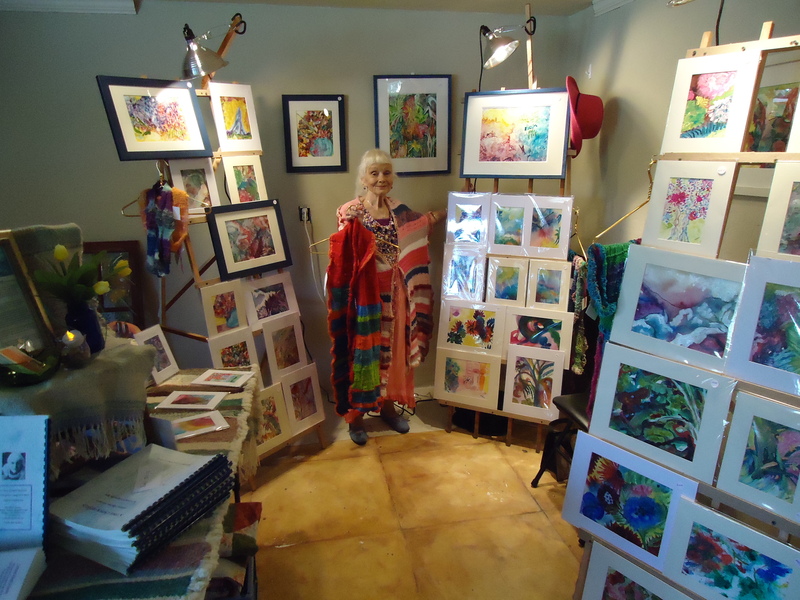 Although I’ve participated in many fiber arts shows over the last thirty years, yesterday’s event was a “first” in terms of displaying and offering paintings for sale. Twelve artists, each very unique with different wares, gathered in an empty store front in Hartland, Wisconsin for a 4-hour event—a part of GIRLFRIENDS GALA, sponsored by merchants in the downtown area of that little city. What fun, and what a congenial bunch of kindred souls! I didn’t have to call BRINKS to transport my earnings to the bank, as I didn’t make any sales. But the evening was well attended, and the dividends of sociability filled my cup of joy to overflowing! My husband, Joe, made the display racks out of garden trellises. He put back legs on the trellises, and secured them to the front with cross bars which are collapsable by removing screws and wing nuts. To prop the paintings, Joe used drywall shims placed at vertical angles to the horizontal strips on the front of the trellises. How wonderful to have a good man, who is also an engineer by gifting and training—and a construction contractor by trade! Also, Joe insisted on rigging up spotlights on each trellis. 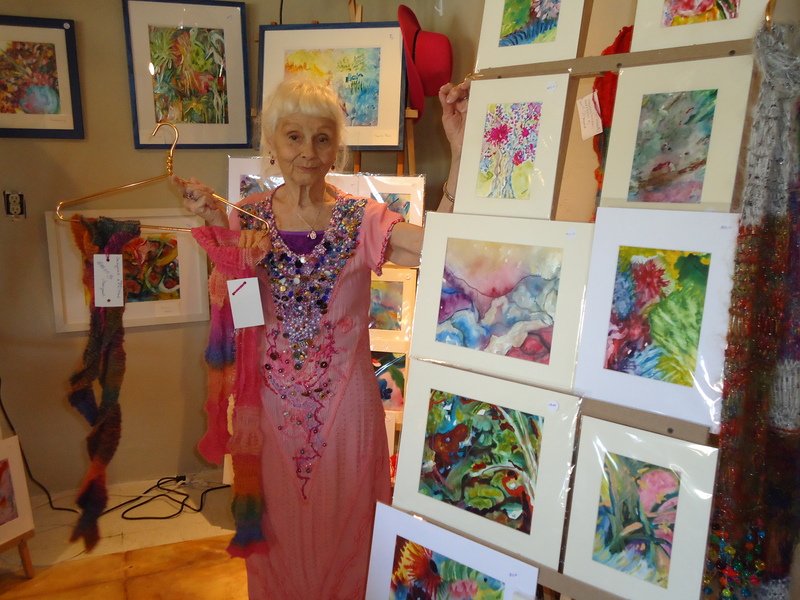 I included some of my self-published books with the paintings, and also fiber arts creations as texture is always a plus. The colorful shawl which I’m holding in my right hand was not only hand spun and hand knitted by me but I washed, carded, and dyed the wool as well. That one must represent 100 hours of happy labor. I don’t ever want to part with it, so I priced the shawl at $250.00. That way I could add color and pattern to the display without much danger of losing my prized garment which keeps me cozy throughout a Wisconsin winter. The setup and breakdown of this display was quick and easy, and we anticipate more “gala” events. And who knows? Maybe even a sale!